It’s not quite the “manic pixie dream girl” artificial intelligence that is pictured in the movie Her, but Sony’s Xperia Ear is probably the closest thing you can have to ScarJo in your ear right now. The Sony Xperia Ear is designed to function like a virtual assistant. Using Sony’s voice technology, it can take and make calls, alert you of incoming messages, remind you of events in your calendar, and dictate short messages by responding to your verbal commands. The same technology allows the Xperia Ear to give you directions using your smartphone’s GPS, tell you the weather, read out the day’s headlines, and perform an internet search. In Sony’s press release, it emphasized that “it enables its users to face forward and get things done, for a convenient hands-free experience.” By taking away the constant need to look at your phone, the company hopes that its users can experience the world around them much better. “With our continued passion for technology, we will keep adding new and exciting features to evolve our smartphones. At the same time, we want to change how you access information and interact with friends and family in a closer, natural and more meaningful way,” said Hiroki Totoki, President and CEO at Sony Mobile Communications. The Xperia Ear connects to your mobile via NFC and/or Bluetooth much like other headsets in the market. It has IPX2 water protection, so you don’t have to, excuse the pun, sweat it if you get a bit of sweat on it. It currently works with Sony’s own software, but it’s also compatible with Google Now, which allows you to take advantage of Android’s growing voice control functions. 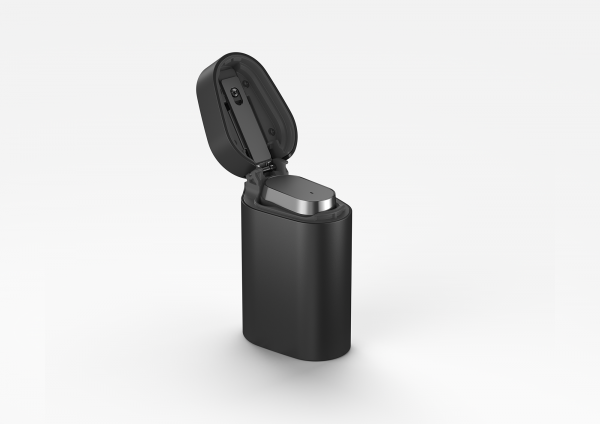 The Xperia Ear also comes with a sleek charging case containing a battery that tops up the three-and-a-half-hour run time of the Ear. Other Sony products at the MCW 2016 include the conceptual Xperia Eye, an ultra compact, wearable wide-angle lens camera, and the Xperia Projector, which responds to touch, voice and gestures just as you would interact with your smartphone screen.